We got some good news today, the fruit portion of the farm share is back on! Unfortunately that probably just means we'll get a few bags of fall fruit each week. I suppose it's better than nothing. So now you can look forward to a lot of blog entries about how we ate some apples for dinner. Should make for some good reading! There's still a good amount of vegetables in the fridge left over from last week's farm share. Natural Disaster and its old friends Major Apathy and General Defeat got together to make sure there was very little in the way of culinary creating coming out of our kitchen. Peppers are now taking the place of summer squash as the vegetable I feel most burdened with. This week's goal: get rid of as much stuff out of the fridge as possible without buying any groceries. 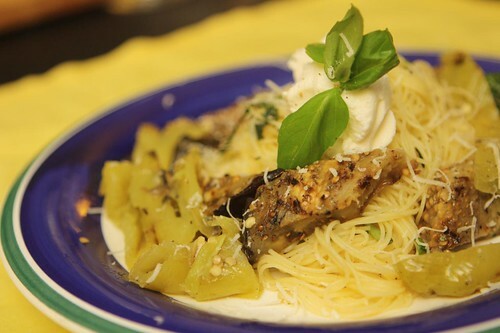 For tonight's main dish I started by slicing the large eggplant into thick slices and marinating it in lemon, olive oil, garlic, salt, pepper, and fresh basil. After grilling them slowly along with one of the Biscayne peppers from the farm I served them on top of some buttered noodles with garlic, basil, lemon, and fresh basil. 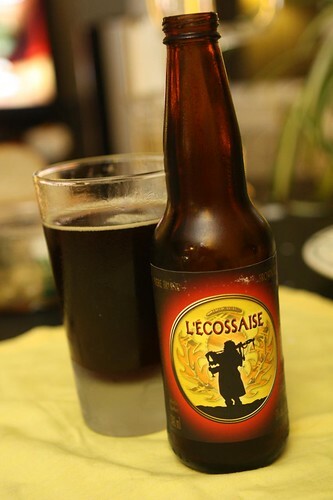 For beer we had this L'Ecossaise from L'Alchimiste. This is a Scottish style ale, one of the beers Jen brought back from Montreal. This beer didn't necessarily go with dinner but the it's always the latest and newest beer that interests me the most. Who can argue about the merits of pairing beer with food when this beer was made by alchemists? 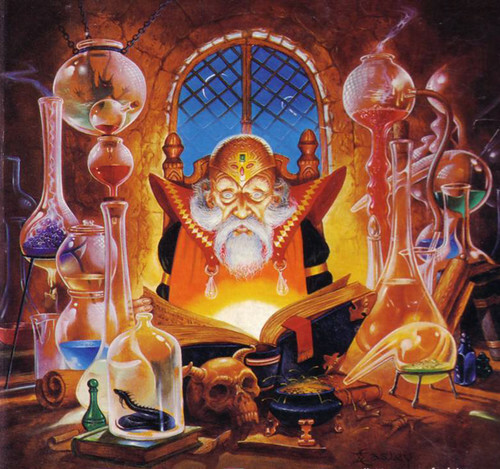 Here's a picture of their brewmaster, Greybeard Featherwand, working on developing their next microbrew. We still had some Samoa mixture leftover the fridge from our home made Girl Scout Cookie experiment. 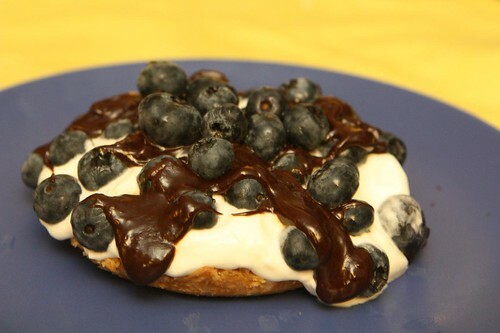 I don't know how good an idea it was but I decided to press the mixture into the bottom of a bowl then top it with blueberries and melted chocolate for a makeshift dessert. It was a little strange but not as strange as Jen thought. She thought that I'd made this tart on top of one of the Montreal bagels she brought home. She's normally suspicious of any weird things I throw together but she was so glad it wasn't a bagel that she was delighted at the idea of this dessert. However, it does give me an idea for tomorrow's dessert.